Another blast from the past was unearthed tonight. 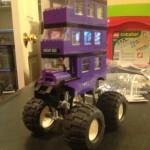 This “Monster Truck Knight Bus” was in the same red bucket as the aforementioned Maresk Blue modular building. 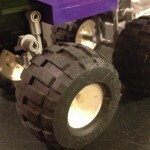 It uses the same tires that I used on a couple other Monster Trucks which came from the 5561 Big Foot 4×4. 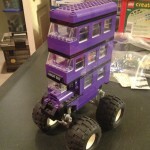 This “conversion” was initially done as a joke after I had turned the Flying Car from the Escape From Privet Drive into a Monster Truck. Both would get pretty good reactions from both kids and parents when they saw them on the NCLTC layout. Yes, it would tip over pretty easily. 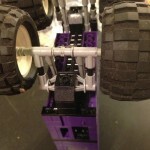 Suspension – kind of dusty! This entry was posted in Caught My Eye, Odd and Ends and tagged Exhibit, NCLTC, train layout. Bookmark the permalink.